Pick one... 6' x 36" 8' x 36" 10' x 36" 6' x 42" 8' x 42" 10' x 42"
The Titan Pro Rail's economic price and labor saving installation make it a great alternative to wood railing and the maintenance that goes along with it. The Titan Pro and Titan Pro XL are the most popular vinyl rail systems that RDI has to offer. 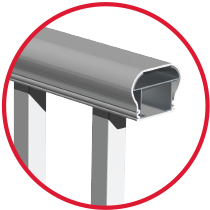 The Titan Pro rail system with its galvanized metal to metal connections ensures an easy and safe installation process. The key to this system is the different style posts with the galvanized brackets already welded to each in different locations for all applications. Railing Heights ~ 36" ~ 42"
The Titan Pro is a very durable corrosion resistant aluminum railing system that is clad in an extremely low maintenance free co-extruded vinyl that will not fade from the sun or be affected by the cold.